Neel Water Treatment Systems Pvt. Ltd.
We Offering you a complete choice of products which include Water Treatment Plant such as Reverse Osmosis System, Mineral Water Treatment EDI Units and many more items. The process of reverse osmosis removes dissolved salts as well as organics. The process can be explained as the raw water flow through the membrane by applying pressure, in the process a small percentage of the feed water permeates the membrane, the balance portion of water moves alongside the membrane without being filtered and moves out of the system. The stream which permeates through the membrane is the permeate, the second stream of water is called the concentrate because it carries the concentrated salts and other contaminants which are not able to permeate through or rejected through the membrane. Since the two streams of liquid flow side by side to each other this process is also called cross flow filtration process. Neel Water RO Plants are fully designed in compliance with the standards requested by the international Pharma Companies. We are offering a wide range of RO Water treatment plant that helps in iron removal, water softening and demonetisation manufacturing in line with the set industry standards. This water treatment plants can treat surface as well s ground water. Besides removing mineral like iron, manganese, silica etc. 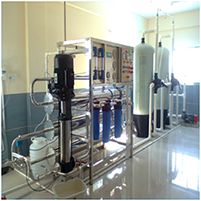 these water treatment plants also helps in removing bad taste and odor from water. Neel Water RO Plants are the result of many years of experience and constant technical development. 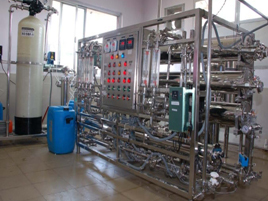 • Production of Ultra pure water for Pharmaceutical, cosmetic and food industries. • Production of deionised water for industrial use when high bacteriological and chemical quality is required. • For Plant monitoring and data reporting SCADA system installed. All rights reserved by Neel Water | Developed by : Dotcom Services India Pvt. Ltd.